If you thought the internet and email were amazing, you ain’t seen nothing yet. New Web 2.0 technologies are already being developed and having an impact on healthcare. Nick Saalfeld sets out to find out what patients, doctors and policy makers are doing with collaborative and multi-media technologies.Internet technologies have changed the way almost everyone works. We can now communicate at lightning speed, work with peers on the other side of the world and find information at the click of a mouse. My name is Susanne Doddrell and I am the Quality Coordinator for Lifeline Aotearoa. We have a fantastic website at www.thelowdown.co.nz which provides info and support for young people in relation to Depression. We also operate a message board open to postings. In this forum we aim to foster and encourage an environment of hopefulness around depression, with information, questions, stories and support from service users and their peers. What I am interested in is any research on best/good practice guidelines with reference to message board moderation in the area of mental health. Is this something that you can help with, or know of anything/anyone that I may be able to access to obtain this information. Our service is currently developing guidelines, and I am finding it difficult to locate literature specifically related to this. If this is something that you are able to help with, or even direct me in the appropriate direction, it would be much appreciated. Enroll in the Tufts Summer Institute on Web Strategies for Health Communication, http://webstrategiesforhealth.com/, to learn how you can help healthcare organizations develop and implement Web strategies to drive the success of their online presence. Healthcare organizations are faced with an ever evolving choice of Web technologies that make it challenging to create a coherent and justifiable Web strategy. At the Tufts Summer Institute, you will learn how to select, use, manage, and evaluate the effectiveness of Web technologies for health communication. • Use the Web to communicate with and connect to patients. • Develop a coherent and justifiable Web strategy for health communication. • Select and manage Web 2.0 technologies to create a Web presence that provides a rich user experience. • Accelerate your online presence through the use of social media sites and tools such as Facebook, twitter, ning, and WordPress. • Employ research-based methodologies such as persona development and formative evaluation to increase the effectiveness and reduce the risk of Web development projects. • Learn the best practices employed by leading health Web sites including WebMD.com, MayoClinic.com, CDC.gov, TuDiabetes.com, WeightWatchers.com, Livestrong.org, CureTogether.com, Roadback.org, and ABC News Health. Web Strategies for Health Communication runs July 19-24, 2009. The course meets at the Tufts University School of Medicine campus in Boston from Sunday, July 19, from 5-8 p.m. and on Monday-Friday, July 20-24, from 9 a.m. – 5 p.m. It is offered through the Health Communication Program at Tufts University School of Medicine. Enroll in the Summer Institute at http://webstrategiesforhealth.com/. Registration costs $900 before June 19 and $1000 after. While parts of the private sector have begun to adopt electronic medical record (EMR) software, many physician practices and regional health IT partnerships still are struggling with absorbing the costs of the software. That was the message from some of the speakers this week at the inaugural National Health IT Day. The event was sponsored by more than 40 public and private-sector organizations to increase awareness of IT’s potential to improve health care and control some its spiraling costs. Medicity and Novo Innovations today announced their merger, combining two market leaders in health information exchange into a single, industry-leading company that connects more than 1,800 healthcare organizations and 85,000 physicians across the nation. The company has established thousands of data interfaces to more than 150 unique healthcare IT applications from every major hospital systems vendor and more than 25 unique electronic medical record (EMR) systems. It serves three statewide health information exchanges (HIEs), including Delaware Health Information Network, Mississippi Coastal Health Information Exchange and California RHIO, and has exhibited demonstrable success with the National Health Information Network (NHIN). Terms of the merger were not released. The company will be known as Medicity and will maintain its headquarters in Salt Lake City, Utah, with offices throughout the U.S. including Novo’s Alpharetta, Ga.-based facility, which will serve as the focal point of East Coast operations. “Together, we will be able to offer a unique approach that allows healthcare organizations to individually meet their information outreach needs by providing streamlined access to healthcare data information, secure distribution of that data to EMRs and full participation in community information sharing initiatives. Our technologies and services collectively lay the foundation for a revolutionary approach to address the interoperability challenges of the healthcare industry of tomorrow,” said Robert Connely, C.E.O. of Novo Innovations. The latest in Cambridge Network’s series of ‘Meet the Clinic’ events, focussing on patient health records (PHRs) and the opportunities that electronic PHRs might offer, takes place on Tuesday 17 February at The Clinical School, Addenbrooke’s Hospital. Personal health records (PHRs) help a patient, their relatives, and their clinicians to better manage the patient’s illnesses. Paper PHRs are common in some countries, like Italy, where the patient is responsible for keeping and carrying medical records from one clinician to another. But England’s mass digital medical infrastructure offers many interesting and powerful possibilities with electronic PHRs. * Melissa Hillier from the Genetic Interest Group will explain patients’ needs for PHRs. Dr Al-Ubaydli will chair the subsequent panel discussion and Q&A. The aim is for attendees to leave with concrete steps on why and how they should implement PHRs in clinical practice. The meeting will start at 16:00 with registration, and will close at around 19:00 after a networking reception. Attendance at this event is free to all staff/researchers at Addenbrooke’s Hospital and the University of Cambridge, and to Cambridge Network members. Please click here to register to attend. Cambridge Network is grateful to Addenbrooke’s Hospital for their assistance with the arrangements for this event, and to Microsoft UK for sponsorship. Dr. Mohammad Al-Ubaydli (www.mo.md) is a PHR researcher at UCL’s Centre for Health Informatics and Multiprofessional Education (www.chime.ucl.ac.uk). He trained as a doctor at the University of Cambridge and as a programmer at Anglia Ruskin University. He spent six years as a researcher in the USA and wrote six books about the use of IT in health care. His most recent, Streamlining Hospital-Patient Communication: Developing High Impact Patient Portals, discussed the use of PHRs by hospitals in the USA. He is the founder and CEO of Patients Know Best (www.patientsknowbest.com), a Cambridge-based PHR company. Dr Amir Hannan is a full time General Practitioner at Haughton Thornley Medical Centres in Hyde and a founding member of the Records Access Collaborative having enabled all his patients to be able to have full access to GP held records via the internet if they wish for over three years. Over 600 patients of his are now accessing their GP records this way. He has helped to develop a practice website, www.htmc.co.uk, which supports patients, clinicians and managers in a world where information and services can be made available for patients and their families. He is the Information Management &Technology lead for NHS Tameside and Glossop (formerly known as Tameside & Glossop PCT), having recently stepped down as Clinical Governance lead and as a Professional Executive Committee (PEC) member. He is also a member of the local Care Record Development Board supporting patients, clinicians and managers to understand how personal health information can be shared across a health and social care setting and to promote best practice by combining local expertise with national and international experience and knowledge. He has recently become the Primary Care IT lead for NHS North-West (formerly known as North-West Strategic Health Authority) and is a member of the Map of Medicine strategy group, NHS North-West. He is also the Greater Manchester NHS Clinical Assessment and Treatment Service clinical lead on behalf of Greater Manchester PCTs. Dr Hannan has written and lectured extensively on health informatics matters and his experience to date. He is also a member of the HealthSpace Reference Panel (www.healthspace.nhs.uk) as well as the National Clinical Reference Panel for the Summary Care Record within NHS Connecting for Health (www.connectingforhealth.nhs.uk). He is a member of the Clinical Leaders Network (www.cln.nhs.uk); a member of the Primary Healthcare Specialist Group (www.phcsg.org), a branch of the British Computer Society; and a member of the editorial board of the “Journal of Communication in Healthcare”. He feels most patients should become eMPOWERed in order to support Real-Time Digital Medicine! Melissa Hillier advises the NHS on PHRs as the Senior Communications Manager at the Genetic Interest Group (www.gig.org.uk). This is the UK alliance of charities and support groups for all people affected by genetic disorders. GIG’s mission is to promote the development of the scientific understanding of genetics and the part that genetic factors play in health and disease, and to see the speedy transfer of this new knowledge into improved services and support for the treatment of currently intractable conditions. Ms. Hillier’s work includes helping to raise awareness of genetic conditions amongst health professionals, the media and the public in general, as well as keeping members abreast of developments taking place that will have an impact on them. She also works on various projects in a variety of capacities ranging from membership of Steering Committees to input into key debates through conferences and workshops as well as the management of a variety of GIG’s Projects, including the Facilitating Networks Project, Insurance Templates Project and Patient Engagement in Scotland Project. Many people have asked me to comment about the latest Washington plans for healthcare IT. The best and brightest on the Obama transition team, the House Committee on Science and Technology, and the Senate HELP Committee have been talking to academic, industry and government healthcare IT experts. I believe the message from experts is consistent. The dollars allocated need to fund education, training, and implementation of interoperable CCHIT certified EHRs. What do I mean by interoperable? For 2009 it means result reporting, e-prescribing, and clinical summary exchange. For 2010 it means quality measures, population health, and personal health record exchange. For 2011 it means clinical research/trials support. Here is a document describing the the current CCHIT certification requirements written by Mark Leavitt and containing my thoughts on the interoperability that is available now. Seventeen primary care trusts are due to begin implementing the Summary Care Record before 1 April as part of a ‘fast follower’ group that will lead the national roll-out of the SCR. Five PCTs – Stoke-on-Trent, Lincolnshire, Medway, Brighton and Hove, Ashton, Leigh and Wigan – have been named as confirmed fast followers, and the first of these is expected to start sending patients information on 23 January. Lincolnshire PCT aims to start its patient information mailing on 30 January, with start dates in February and March for the other three PCTs. A further 12 PCTs have been identified as potential fast followers. These include three London PCTs – Barnet, Camden and Southwark – plus South Tyneside, Surrey, Middlesborough, The Isle of Wight, Hampshire and Bristol. On the same day that we reported that an IT industry group was calling for stimulus money to go toward modernizing the electronic healthcare infrastructure, President-elect Obama delivered. In a speech in Washington, he called for providing electronic patient records throughout the country within the next five years. It’s a lofty goal, and one with the potential to have significant real-world benefits; unfortunately, the following day, a report from the National Academies of Science suggested it’s one we may not be ready to pursue, as a continuation of current practices runs the risk of harming our progress toward a modernized health care system. 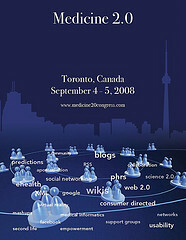 The Medicine 2.0 Congress was held last week in Toronto, Canada. I attended on my way back from the AMEE 2008 conference in Prague. My role was to chair the session on medical education on day 1 and to present 2 talks on day 2, one on mobile computing and one on online communities. The event was a great opportunity to catch up with my health informatics colleagues and meet face-to-face with previously only online acquaintances. Peter Murray gave an excellent keynote address, introducing the conference and some of the themes of Medicine 2.0 on behalf of the IMIA. Gunther Eysenbach followed with his welcome and an introduction to the concept of ‘Apomediation’. For those not in the know, you can read up on apomediation in his JMIR article introducing the concept. The ‘Medical Bloggers’ panel consisted of Berci Mesko, Peter Murray, Jen McCabe Gorman, Keith Kaplan and Sam Solomon. The panel included some great presentations, and I found Sam’s tale of medical blogging gone wrong particularly interesting. After lunch, I listened to Leanne Bowler talk about teen health sites and Margaret Hansen gave us an insight into the world of virtual reality medical education. Next up was the session I chaired on Medical Education. We had a great presentation from Panos Bamidis, who talked about the use of Moodle and other e-learning technologies he uses on his Medical Informatics courses. Deidre Bonnycastle was a very enthusiastic advocate of e-learning tools and told us about the various technologies she had tried at the University of Saskatchewan. Berci Mesko gave a very interesting talk about protecting your online reputation and he also showed us some of the fascinating presentations he has attended in Second Life. Finally, Rod Ward livened up the crowd with an animated discussion about all aspects of the use of Web 2.0 technology in medical education. The next day kicked off with talks from Judy Proudfoot, Caryl Barnes and Lisa Whitehead on the subject of Methodological Issues and Challenges in eHealth Research. Next up was my session with Carol Bond, Shirley Fenton, myself and Ken Seto. We talked about various aspects of running online medical communities for education and developing professional connections. After lunch I gave another presentation, this time on the role of mobile technology in medicine. My co-presenters for the session included Benjamin Hughes and Indra Joshi, who talked about the kinds of websites junior doctors used; Miguel Cabrer, who demonstrated the amazing MedTing platform; and Marcelino Cabrera Giraldez, who talked about how Web 2.0 can be used for patients with rare diseases. The day rounded off with presentations from Joan Dzenowagis of the WHO and Kevin Clauson who gave a very entertaining and interactive session on the risks associated with Web 2.0. The Health Informatics Discussion Forum is a social network set up by Health Informatics lecturers and students. We now have almost 350 members (and counting…) from all over the world and lots of interesting discussions about health informatics. If you haven’t joined yet, you can register here, and if you are already a member, you can invite your friends and colleagues to join by clicking the ‘Invite’ link on the main menu.